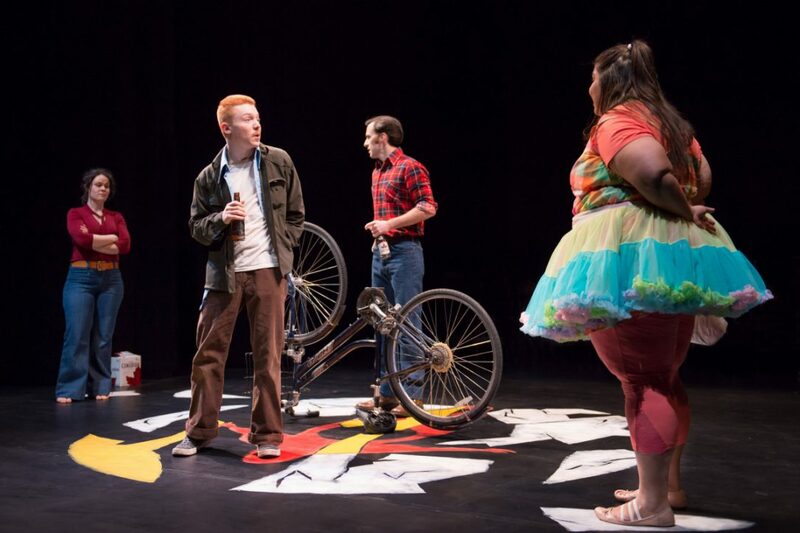 The Crackwalker is now on stage at Toronto’s Factory Theatre, directed by its own playwright, Judith Thompson. Originally written in 1979, the story takes place in Kingston, Ontario, in a town that is no particular town but could be any town (well, except Oshawa). The character of the Crackwalker (Waawaate Fobister) initiates the play with a dance, but continues to involve himself with the action either by observing or engaging with the characters. He is both a homeless native man but also a larger symbol of our forgotten origins and the cracks in our societal structures. The rest of the play revolves around the lives and dysfunctional relationships of two couples: Theresa (Yolanda Bonnell), a mentally challenged woman, her boyfriend Alan (Stephen Joffe), and their friends Joe (Greg Gale) and Sandy (2015 MyTheatre Award winner Claire Armstrong). Thompson’s plays are dark, to say the least, but underlining her gritty narratives is a striking compassion for even the most abusive and dysfunctional characters. Each character tries to cling to something to give them meaning: a job, an identity, a lover, a baby. They all seek reflections of themselves in each other, and even when they don’t always find what they want there, and they often don’t, they come back for more, because it’s all they have. While I am a huge fan of Thompson’s plays, I’m just not sure that the production lives up to this dark, complicated, and soulful narrative. On paper, Thompson’s writing style is unique. The pages are full of all caps, ellipses, and half-formed sentences. She writes in a way that often mimics actual speech, which is sometimes more difficult to act, contradictory though it may seem. This results in erratic execution. At times, the dialogue is so realistic it’s mesmerizing, while at other times it feels stilted and forced, as though the actor in question hasn’t quite managed to internalize the thoughts and feelings of the character. The actors all seem capable, so it might be a function of being under-rehearsed, but it feels jarring to be jerked in and out of the life of the characters. Beyond this, the production lacks a rich atmosphere. Thompson makes good use of the space with the action, but the production feels like it needs something more, even within the Factory’s “naked” concept- lighting shifts and contrasts, better transitions, a stronger musical score. As it is, the audience is looking through the action at another audience. This might be metaphorical (rather than simply pragmatic) – a forced confrontation with our own society, perhaps – but right in the middle of the onstage audience on opening night was Thompson herself, watching us watching her watching us watch the play. There is something too intellectual about that to seem appropriate for such a visceral play, and yet it is an example of the larger problem, namely that this production might have benefitted from Thompson’s presence being less front and centre.